Posted on July 10, 2017, in Lumen, php, silex, Symfony, Technology and tagged deSymfony, Laravel, Lumen, php, silex, Symfony. Bookmark the permalink. 31 Comments. Did you read: https://jason.pureconcepts.net/2017/02/lumen-is-dead-long-live-lumen/ ? Hi, Try Slim + PHP-DI (with PHP-DI/Slim-Bridge). Very little dependences and good start point. I recommend you to check also Slim micro framework. imho is the better micro fw you can use at the moment. If you’re looking to build robust API rather easily, also have a look at https://api-platform.com/. Try Slim Framework. Very much like a more generic Silex without all of the Laravel cruft in Lumen. A lot of comments with Slim. In fact it was the second one in the list of microframeworks to try. Maybe I’ll try it. I’ve a dummy project ported from Silex to Lumen. I’ll try to port it to Slim too. Thanks! You might want to check out Slim if you are not familiar with it. It is, IMO, the best micro-framework and is unopinionated concerning using Symfony or Laravel (or any other) libraries. The micro kernel is in the framework since 2.8, so you can use it today. One of the tricks I’ve learned along the way, is to keep my program as loosely coupled to the framework of choice so switching is always possible with less impact. The real business-value (and logic) of a program should never lean on the framework. Just change the framework-part and of we go again. Can someone tell me what are the disadvantages of Silex? 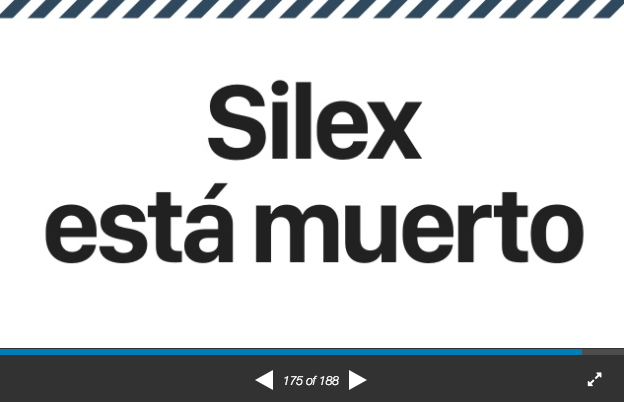 but the official Silex page doesnt inform us about silex death, it’s true? True stroy! 🙂 The same for me.